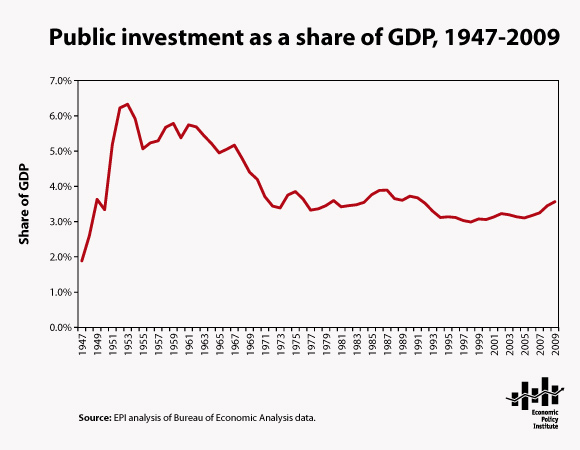 Public investment—which includes strategic investments such as education and infrastructure—are near a 60-year low as a share of gross domestic product (GDP). As the Recovery Act recedes, the already low investment share is likely to fall below the historic nadir. Increasing these investments, as President Obama has proposed, is long overdue and will lead to immediate job creation, long-run global competitiveness, and economic growth. The chart, from the Bureau of Economic Analysis, shows all public investment (federal, state, and local) as a share of GDP since 1947.